InfiniLED Ltd was spun out of UCC’s Tyndall National Institute’s in 2011. InfiniLED Ltd was spun out of UCC’s Tyndall National Institute’s in 2011. UCC staff members Bill Henry and Padraig Hughes joined the company when it was founded. The CEO was Joe O’Keeffe, who had been a CEO of previous UCC spinouts. UCC licensed Intellectual Property to InfiniLED at establishment and took a minority stake in the company. The technology is based on the patented Micro-LED breakthrough developed by Brian Corbett, (a previous recipient of an Intel Researcher of the Year award) and Pleun Maaskant. The initial patents on this technology were filed by UCC in 2003 with subsidiary applications in 2007 and 2011 from research funded from national and European sources, including Enterprise Ireland. UCC patents protect a unique shape of LED, which maximises the efficiency of the light which can be generated from one of our LEDs – the angle at which light emerges from an LED is very wide. So it isn’t collimated. It spreads out. This is known as aperture. The wider it is the more difficult to focus the light, thus some light is “lost”. Also typically LED devices lose light internally as it never escapes from the chip due to what’s known as internal reflection…the light bounces around inside the substrate and never emerges. UCC technology overcomes that better than competitors. This means (1) more light out, (2) more collimated. InfiniLED was housed initially in the Tyndall’s Lee Mills House unit where they have some dedicated company space for industry partners in their research domain. They moved to a city centre premises as it expanded. InfiniLED also established an access agreement with Tyndall National Institute to allow it to leverage technical facilities in Tyndall to support the company R&D effort. InfiniLED received investment in 2012 & 2015 from private sources. UCC retained its minority shareholding in the company, diluted with each investment. InfiniLED used the IP to focus on creating low power microLED display technology. iLED Displays (Inorganic LED Display) are the next generation of energy efficient display technology for applications ranging from wearables to TVs. InfiniLED’s aim was to create arrays of microLEDS that offer 20-40x reduction in power consumption. 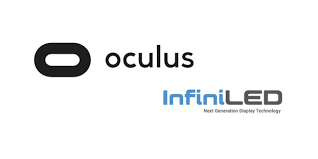 InfiniLED was acquired by the Facebook owned company, Oculus. Oculus’ interest is in Virtual and Augmented Reality Technologies. Through this acquisition, the UCC technology is now being integrated into the Oculus development programme, with high quality research and technology jobs created in the region and the potential for further research opportunities with UCC. They formed Oculus Research in Cork. A key component for Oculus products is the DISPLAY unit. These require projectors (miniature) and thus need light sources. LEDs have emerged as the light source of choice because of their size, flexibility of array designs, mounting on curved surfaces, lifetime, low power etc. InfiniLED technology helps get more light per unit of power inputted (battery). The light is brighter, more collimated, more controllable. With low power consumption they aim to increase battery life and avoid sacrificing light quality. Since acquisition, UCC and Oculus have established significant research collaborations. 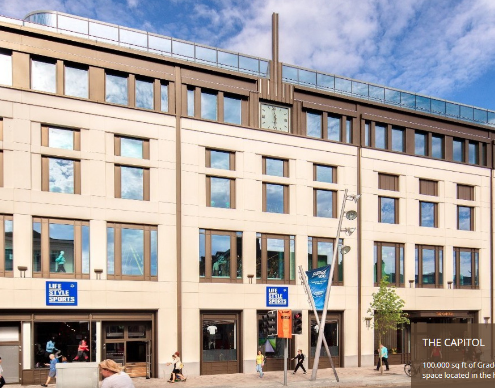 The company has taken space in Cork City Centre premium office accommodation in the newly built Capitol Complex. (A noteworthy comment here is that this complex also houses Huawei Ireland offices, another UCC research partner). The company has expanded its operations in Cork to develop the technology rather than move the operation to the US. Currently they are advertising 21 high quality research & engineering posts having already expanded their operations by up to 9 posts last year. The long term investment in UCC research capacity, technology and Intellectual Property rights is now creating inward investment supporting high quality jobs and capital developments in our economy.